Now that the long winter cold is winding down and spring is in the air, get out and enjoy our natural world. 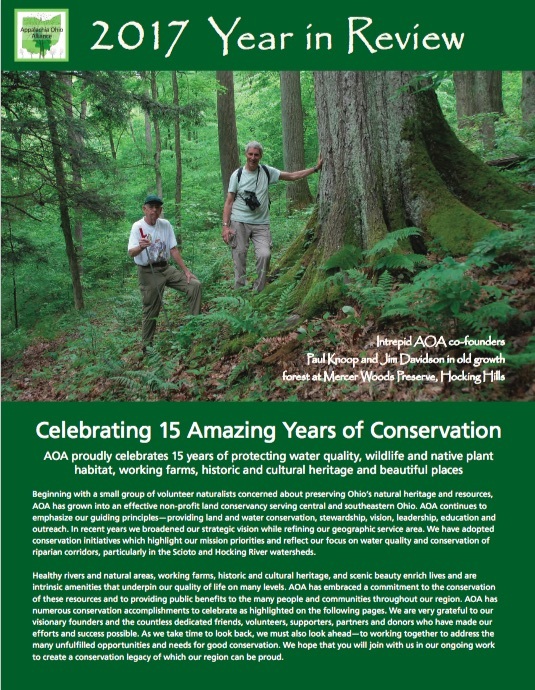 Visit one of AOA’s newest and largest preserves and help us make a lasting difference by planting trees to reforest a portion of our Earthtouch Preserve property in Vinton County. New Hawthorn, Black Locust, and Burr Oak trees will help reclaim and restore a section of open, strip-mined field to hardwood forest, integrating this portion of the site into the adjacent forests. We will provide shovels, gloves and trees to plant. Please dress appropriately for the weather and using a shovel. This is a family-friendly event – feel free to bring the kids and instill stewardship values. AOA acquired this property as part of our merger with EarthTouch. Afterwards, stay and enjoy a hike on the forested portions of the EarthTouch Preserve or pay your respects by visiting one of the on-site memorials – to former AOA board member John Husted or naturalist and EarthTouch founder Lou DeWein. Location: EarthTouch Preserve property, located just north and west of McArthur. Access the site from the south off of U.S. Highway 50. Look for our sign posted at the intersection of U.S. 50 and Peacock Road just across the street and a bit north of the Vinton County High School. Travel north on Peacock Road, bear left at the Y, until you see us. What to Bring: Feel free to bring a lunch or snacks and stay to enjoy a picnic lunch on the Preserve. Rain Date: Sunday, April 2, 1:00 p.m. Event will be postponed only if really bad weather is expected – check with Al Altfater should you have any questions about the rain date at 614.783.0220 (cell).